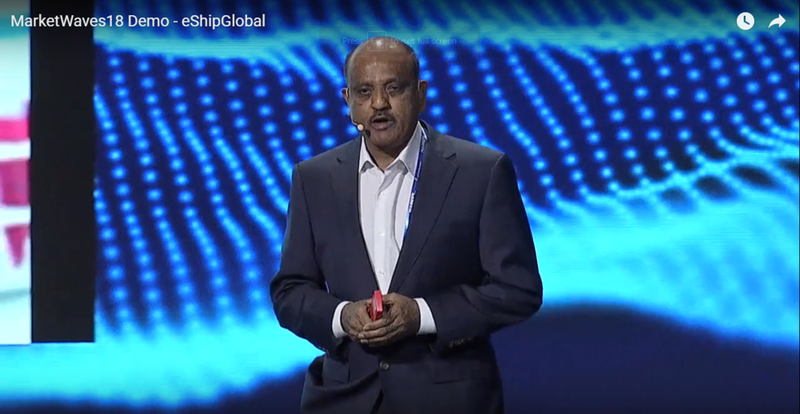 Srini Vasan, founder and CEO of eShipGlobal, and partner Terry Beaudine from IBM Blockchain Solutions, demonstrated at MarketWaves 18 in Dallas last month how eShipGlobal provides a one-stop solution for shipping expedited hazardous materials and other packages using blockchain technology. Vasan explained that eShipGlobal, a Dallas-based, non-asset 4PL, offers customers software solutions and expertise with a focus on customer service to expedite small parcels and critical documents both domestically and internationally. “My customers tell me their greatest fear is that [boxes sent through the mail] are prepared by unknown parties, with an unknown number of items inside the box, with no markings outside,” Vasan said, which can create public safety and compliance issues. Vasan and Beaudine used the example of “Jack,” a hospital worker who wanted to send a hazardous material expedited shipment – in this case, blood – internationally. After logging in, Jack could see through the blockchain ledger the different parties participating in his secured shipment – the receiver, customs broker, carriers, and regulators involved. Hitting the “location” bar, Jack was able to see his shipment as it was tracked on a global map, including delivery status mode of transport while in transit, with all data in real time based on data scanned by the carriers participating in the network. eshipGlobal provides all the required documents by law, Vasan said, which can be shared with the permission individuals participating, such as shippers, carriers and receivers.